The price of silver has dropped 1.5% since last Friday's close of $17.19, putting it on track for its first weekly loss in five weeks. 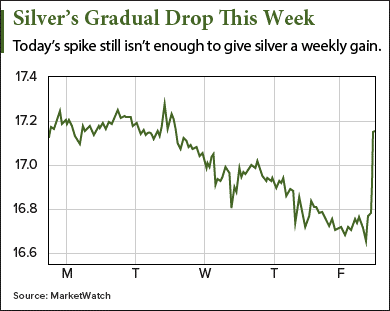 This week's dip came after the price of silver posted a 0.9% gain on Monday. From Tuesday through Thursday, prices dropped 1.9% to close on Thursday at a two-week low of $16.85. The silver price today (Friday, Jan. 27) is up 1.7% to $17.14, but it's still on track to break its weekly winning streak that started on the week ended Dec. 23, 2016. But we're confident that silver prices can run 40% higher by the end of the second quarter. And there's one country that will be largely responsible for that bull run. The biggest reason why the price of silver is down this week is the soaring Dow Jones Industrial Average. On Wednesday, Jan. 25, the Dow Jones crossed 20,000 for the first time in its 132-year history. Investors had been waiting for the index to reach that psychologically important mark since Jan. 6, when it came within one point. As of today, the Dow Jones is up 1.6% to 20,083 in 2017. Silver prices typically fall during stock market rallies. That's because rising stock prices lower the demand of long-term safe-haven investments like silver. When broad market indexes like the Dow Jones are soaring, investors are more inclined to put their money there because it makes it seem like everybody is making money. Even with headwinds from the stock market, our forecast sees the price of silver rising this year. The metal will benefit from rising inflation, a falling gold/silver ratio, and declining short selling in the silver market. But demand for physical silver will ultimately be the fundamental force that pushes prices higher. And there's one country in Asia that's proving to be one of the most dominant silver price influencers in the world.